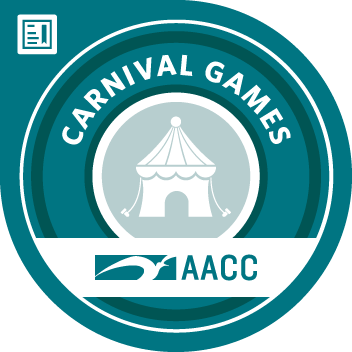 The Carnival Games Badge is issued to students who successfully complete the 48 hour course entitled Casino Carnival Games Dealer (CLI-356) at the Anne Arundel Community College Dealer School. In order to earn this badge, students must demonstrate proficiency dealing Mississippi Stud, Ultimate Texas Hold'Em, Let It Ride, Three Card Poker & Four Card Poker. Entertain and engage up to six guests at one time; Apply excellent customer service skills; Demonstrate communication through clear hand signals Efficiently deal to up to six spots in less than 25 seconds.